1001Tracklists has compiled its data from 2018 to chart the most played dance tracks of the year. The user-powered platform gathered the info from 36,000 tracklists uploaded to the site throughout the year and has presented the results in a chart they’ve called ‘A State Of Dance Music 2018’. Predictably, the list is predominantly focussed on the more mainstream end of the dance music spectrum, with tracks like Fisher’s ‘Losing It’ and Armin Van Buuren’s ‘Bla Bla Bla’ and AU/RA x CamelPhat’s ‘Panic Room’ coming out on top of the Tech-House, Trance and House categories respectively. 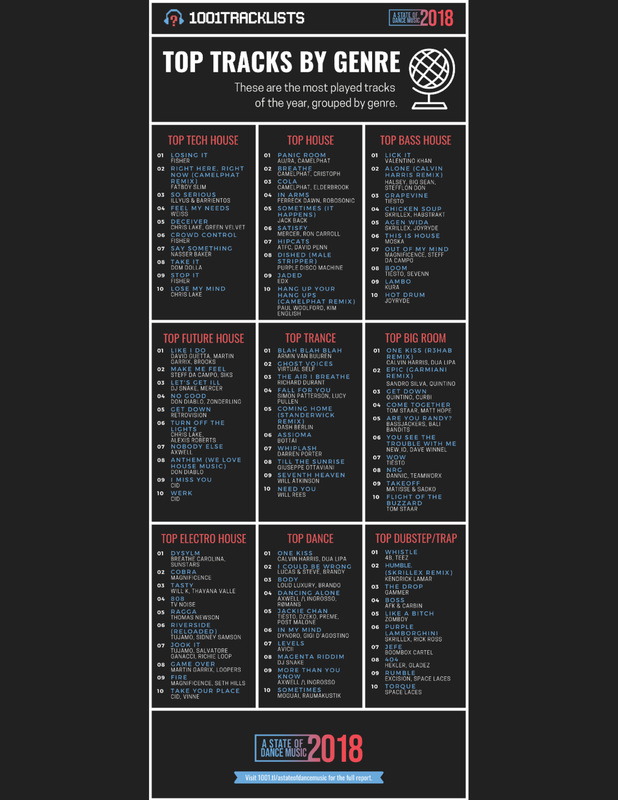 The full report, which you can read here, also includes data on the websites most visited tracklists of the year, the top tracks overall regardless of genre, and the most popular festivals among more info. You can see the full list of genre breakdowns below.